Lord Hutton will begin delivering his verdict on the death of weapons expert Dr David Kelly within 30 minutes. His findings were due as a row grew over what appeared to be leaked details of the report in the Sun newspaper. 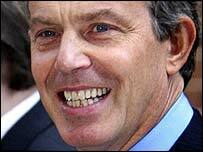 It claims Tony Blair is cleared of any "dishonourable conduct", but the BBC is accused of a series of failings. The Tories have blamed the government for the leak but Downing Street has strongly denied it was responsible, as has the BBC and Alastair Campbell. The prime minister's official spokesman said Mr Blair was "very angry" about the leak. Former Downing Street spin doctor Alastair Campbell has said any suggestion that he was to blame was "totally untrue and deeply offensive". Tory party leader Michael Howard called for the Metropolitan Police commissioner to conduct a full inquiry into the "disgraceful" leak. Mr Blair's spokesman agreed there should be a leak inquiry involving all parties, but said this was a matter for Lord Hutton, who wishes to announce himself how he will proceed. Lord Hutton will set out his key findings in a televised statement at 1230 GMT, an hour before his full report is published. MPs will then be able to tackle the prime minister about the report during a Commons statement at 1400 GMT. Advance copies were given at lunchtime on Tuesday to the government, the BBC and the family of Dr Kelly, after they undertook not to reveal its contents. The weapons expert apparently killed himself last July after being named as the source for BBC reporter Andrew Gilligan's story that the government exaggerated its 2002 dossier on Iraqi weapons. According to unconfirmed reports in the Sun, Lord Hutton cites a psychiatrist's evidence that the scientist committed suicide because he had been "publicly disgraced". Sun political editor Trevor Kavanagh says he has not seen the report, but was given details from it by an "impartial" source over the telephone. He would not reveal details about the source, but insisted his piece was "a précis of the conclusions" of Lord Hutton's report. "What I can tell you is the source had nothing to gain financially or politically, no axe to grind, no vested interest," he told BBC Radio 4's Today programme. "If it had been a report which blamed the prime minister we would have used that ... just as strongly. It would have been a page one story saying that Blair had been criticised, but this isn't the case." Mr Kavanagh said in the report, Alastair Campbell "is cleared", along with John Scarlett, chairman of the Joint Intelligence Committee, and Mr Blair. BBC media correspondent Nick Higham said the Sun had throughout the inquiry put the worst construction on evidence about the BBC and the best gloss on the government's actions. "It may be that what we are getting is a version of Lord Hutton's views filtered through the Sun's eyes," he told the BBC 10 o'clock News. The Sun says the judge is also said to criticise BBC governors for failing to make a detailed investigation into whether Gilligan's story for Radio 4's Today Programme was supported by his notes. The paper says the report finds there was no "dishonourable, underhand or duplicitous strategy" by Tony Blair or the government to leak Dr Kelly's name as the BBC's suspected source. It claims Lord Hutton says the Ministry of Defence was "to be criticised" for not telling Dr Kelly his name could be confirmed to journalists or that it had eventually emerged. He notes, however, that the scientist was not an "easy man to help or advise". But Tory co-chairman Dr Liam Fox said the government's fingerprints were "all over" the leaking of findings from an inquiry which was itself set up to investigate the "unauthorised disclosure of information". The report is the climax of evidence from 74 witnesses over the six weeks of the Hutton inquiry, which involved thousands of pages of documents. Lord Hutton was asked to inquire into the circumstances surrounding Dr Kelly's death, and has spent more than four months writing up his conclusions. Tory leader Michael Howard and Liberal Democrat leader Charles Kennedy spent Wednesday morning reading the report, having been given advance sight of it from 0600 GMT. The report comes after the government scraped a five-vote victory in the House of Commons test of its controversial plans for university top-up fees. "The Opposition want to know how the Hutton report was leaked"